It is no secret that Link has been quite the ladies’ man over the years. Throughout the Zelda series, he has had quite a few girls after his heart, but is that something worth keeping up in future games? Many fans continue to support their favorite couples in Zelda, producing endless shipping fanfiction and artwork, while others resist any idea that Link or any other main character might end up in a relationship. Should Link have, or be subject to, any romantic interests? Join the discussion after the jump! Link is obviously the primary subject in this, so the variable is who he should be with, or if he should be with anyone at all. I believe that the reason some fans do not want him to show his love for someone is because it may take away from his intensity, for lack of a better term. Saving the world, or sometimes even multiple worlds, is what makes Link so awesomely heroic, after all. But what about the important individuals? The people Link cares about. Having feelings for someone is often what adds to a protagonist’s character, and to the story itself. Skyward Sword put this idea to the test, with the obvious relationship-in-the-making between Link and Zelda, and it seems to have worked quite well. Having the close childhood friend, and possible love interest, to fight for gives the hero a starting point leading up to the inevitable journey to save the world, but also a consistent personal goal. This was also the case in previous games. Link’s implied relationship with Ilia in Twilight Princess, alongside his friendship with the Ordonian children, not only gave him a reason to go gallivanting about in the twilight, but also made the later moments of the game where she lost her memory very emotional. 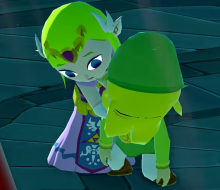 Then there is Spirit Tracks, where Zelda and Link hold hands at the very end, but that more or less seems to be the continuation of that Link’s ancestor’s possible interest in Tetra, or just the developers’ way of pleasing fans at the last second. Of course, Link and Zelda are not the only hinted-at couple in the series. Marin, way back in Link’s Awakening, had obvious feelings for Link, but she disappeared with the island. Midna seemed to truly want to be with him at the end of Twilight Princess, before leaving for the Twilight Realm. Ruto, in Ocarina of Time, even wanted to marry him, before seven years went by, and she had to become a sage. There seems to be a bit of a pattern of girls other than Zelda that Link may end up in a relationship with, but then it turns out to be a lost cause. Perhaps the only love interest the designers want Link to have a chance with is Zelda. That seems a bit unfair. The other ladies may deserve a chance. And what about the men of the series? Don’t any of them have any interest in Link, or anyone else for that matter? Time for you guys to throw in your thoughts. Do you think that Link should have a romantic relationship with someone in the series? If so, who should be the luck lady, or lucky guy? If not, why? Start the discussion in the comments below!